Press the Control key and left-arrow key or right-arrow key to move to the previous or next space. Swipe left or right with three fingers to move to the next or previous space. You can enable or disable these keyboard shortcuts in the Keyboard Shortcuts tab of the Keyboard System Preferences pane. Drag a window to the left or right edge of the screen, and pause. After a short delay, the window pops into the space on the left or right of the current space. Start in the space that has the window you want to move. Enter Mission Control, drag the window from the middle part of the screen onto the space you want to move it to at the top of the screen, and then release the mouse button. It’s often useful to assign a specific application to a specific space. To do so, first launch the application in question; then press and hold down its Dock icon, and choose Options, as shown here. Press and hold down (or right-click) an application’s Dock icon to assign the application to a specific space (Desktop). To have the application open in every space, choose All Desktops. When the application is running, it will appear in every space. To have the application open only in the current space, choose This Desktop. The application opens in this space. If you’re working in a different space and switch to this application, its assigned space scrolls into view. 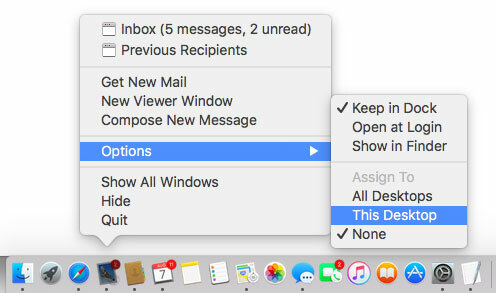 To have the application open in whatever space you’re using, choose None. Finally, should you want to delete one or more spaces, simply enter Mission Control, and move the pointer over the space. A Delete button — an X that should look familiar if you use an iPhone, iPad, or iPod touch, or the Dashboard — appears in its top-left corner, as shown here. Click it to delete that space. Hover the pointer over a space, and a Delete button (X) appears. Deleting a space doesn’t delete or quit any applications or close any documents. Applications and windows in a deleted space move to the space called Desktop (the one without a numeric suffix). The bottom line is that spaces can be particularly useful for those with a smaller display. And it can be even more useful for users with more than one display. Using Mission Control can be an acquired taste, so even if you have a small screen or multiple screens, you may not care for it at first. My advice: Try it for a while, and if you decide that you hate it, turn its triggers off (by selecting the minus sign) and be done with it.